I enjoy reviewing hammock accessories because it’s intriguing to see how people adapt them to the unique features of a hammock. The TreeHugger hammock pillow is one such design. The pillow has a slippery silnylon outer shell that opens to reveal a soft cotton pillow with a polyester fill. The outer shell serves as an integrated compression sack to protect and pack the pillow. The compression straps are long and use adjustable buckles to not only secure and compress the packed pillow but also allow the pillow to be clipped to the hammock and secured in place. The pillow is designed to attach to the end of a hammock end loop and the long straps are adjustable so the pillow will stay in place right where it needs to be: near your head. A hammock already does a good job of supporting your head, but it doesn’t give much support behind your neck or side of your head. This is where I most often need support and comfort. The petit size of this pillow makes it a great head rest inside a hammock and the soft cotton fabric is so much more comfortable than most nylon and polyester fabrics. The straps feel a little too thick and wide for their purpose. I’d like to see the straps and buckle sized down a little. The buckles and straps set are long enough that it can adjust to accommodate most sleep styles. I most often used the pillow on the side of my head, but if I was reading I would put it behind my head to prop me up. The pillow is small enough that you could bring it along backpacking, but it’s really ideal for base camping or when you want to bring along additional creature comforts and you don’t need to worry about additional weight and bulk in your pack. Because of the cotton pillow cover, I would recommend using a pillowcase to keep it clean. A head wrap, like a lightweight microfiber Buff, easily wraps around the pillow and can be easily washed. 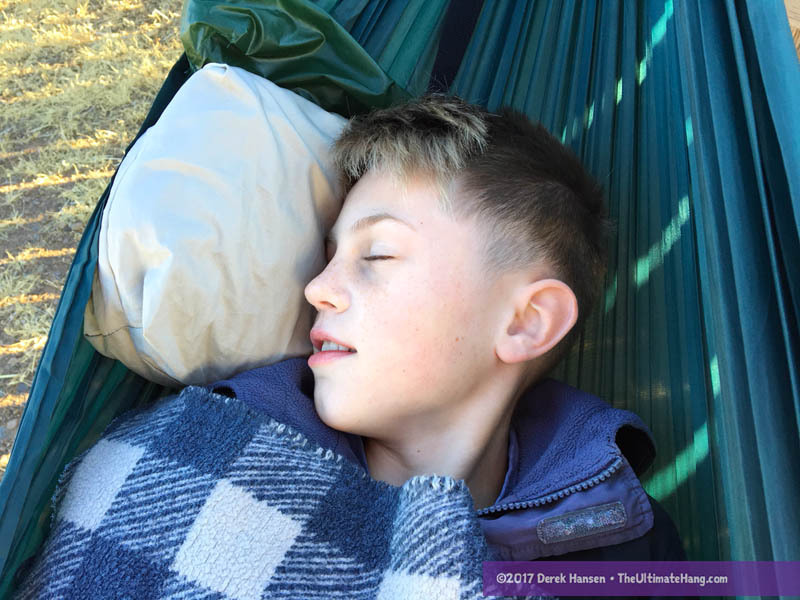 Suspension and Anchor System ♥ ♥ ♥ ♥ ♥ The included strap and cinch buckles are a great addition to a pillow, helping to keep it secure in the hammock. Modularity ♥ ♥ ♥ ♥ ♥ The integrated stuff sack helps to compress and pack. Price and Value ♥ ♥ ♥ ♥ ♥ The materials and construction make this a good buy. It looks like smaller straps and buckles could have been used. A half inch wide strap would have been plenty strong enough to compress, and that would reduce some of the weight. The use of a more open buckle is a slight weight reducer. Way too heavy and bulky for my typical backpacking kit, but OK for car camping, I suppose. Yes, I think it is aimed at recreation hangers. Or those who camp more than hike.